If it were socially acceptable (or if my family would allow it) I would be putting up Christmas decorations the day after Halloween. Christmas is my favorite holiday by far. I love the feeling in the air, I love shopping for presents, wrapping them, blasting Christmas music, baking Christmas cookies, and decorating my house like a mini winter wonderland. How can someone not enjoy glittery glass ornaments, the smell of a freshly-cut pine tree, or the twinkle of hundreds of rainbow lights adorning the house?! Anyway.This year was particularly nerve-wracking because we didn’t set up our tree until yesterday. AKA, December 6th. That’s like, an abomination in my book. I would have ideally loved to set it up the day after Thanksgiving, but since I was out of town, I couldn’t. And when I returned, eager to unpack and decorate, I was informed the carpet cleaner was coming and thus there’d be no point to put it up in his way. Sigh. It was the one time I was actually upset about having my carpets cleaned. These couldn’t be easier to make! Simply dip your Oreos into melted Vanilla CandiQuik, attach a miniature peanut butter cup for the “top” and decorate to your heart’s desire! 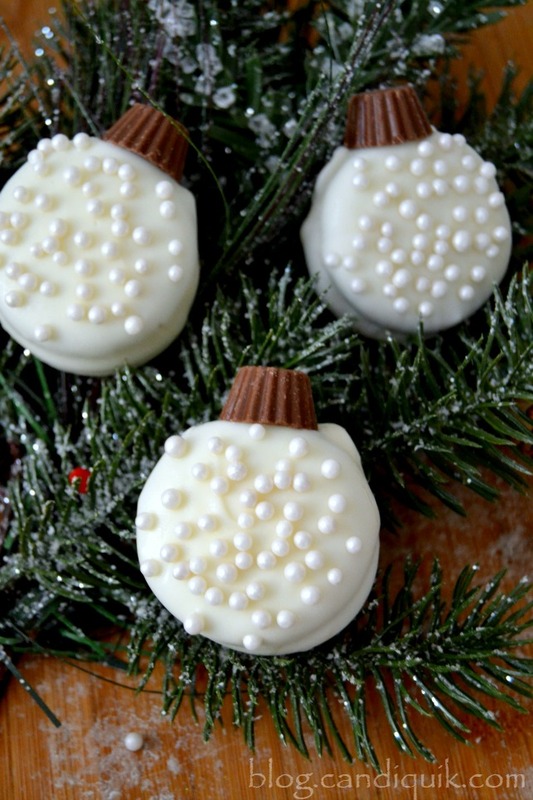 I used a mixture of miniature M&M’s, holiday sprinkles and pearl dragee sprinkles, but you could use other candies, decorative edible accents made of hard sugar, mints, drizzled chocolate or frosting… anything you’d like! I love how pretty and sophisticated the pearl dragee sprinkles look, don’t you?! Oreo cookies are dipped in Vanilla CandiQuik, then decorated to look like miniature, edible, DELICIOUS Christmas ornaments! 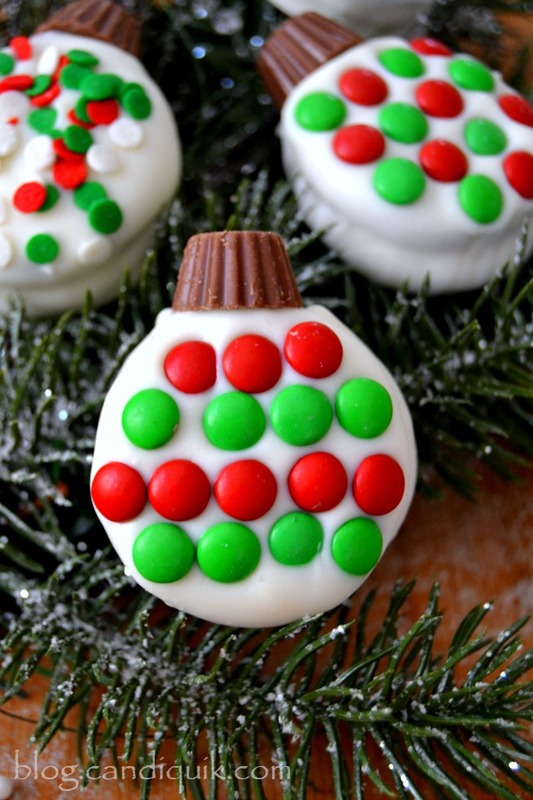 Decorate to your heart's content using an assortment of candies, sprinkles, mints, icing, and more for a unique and incredible holiday treat! Assorted candies/sprinkles (miniature M&M's, Reese's Pieces, holiday sprinkles, dragees, frosting, chocolate, etc). 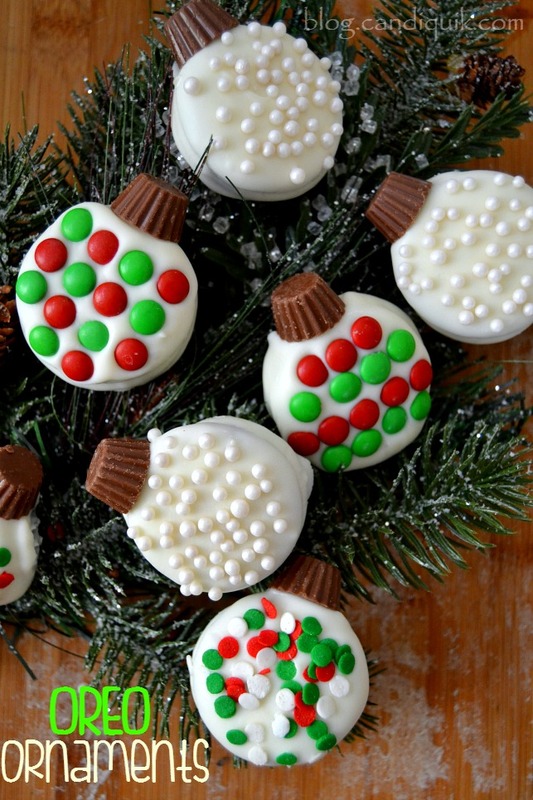 Immediately attach a miniature PB Cup on the top of the Oreo for the ornament topper. 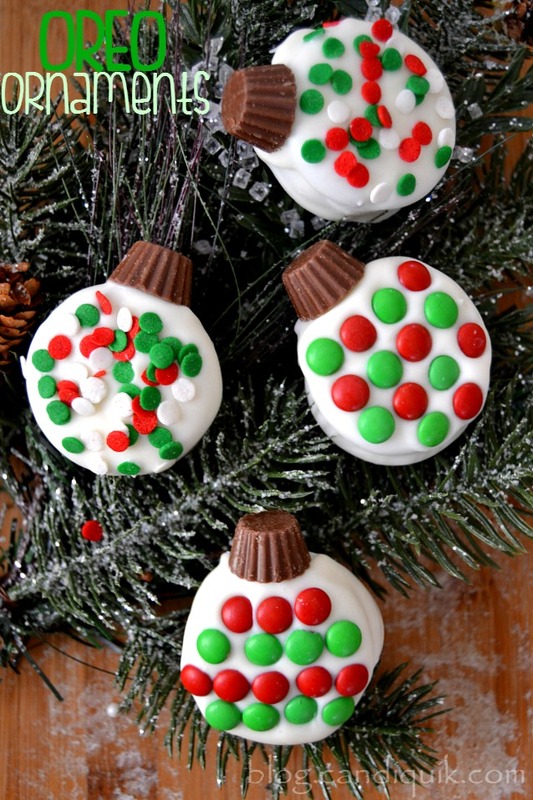 Then immediately decorate the Oreos with the assorted candies or sprinkles. Consider making striped, polka dot or chevron patterns, or any other pattern or arrangement you'd like!